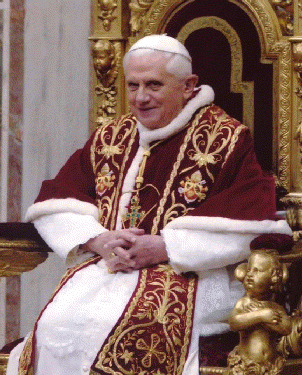 The Popes contains biographical data of the Popes in recent history. 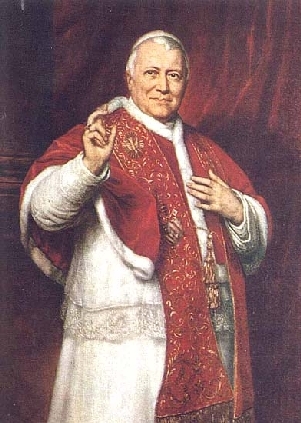 The page "Modern Popes" includes the papal history of the Modern Era, from the Treaty of Vienna (1815) to the present. 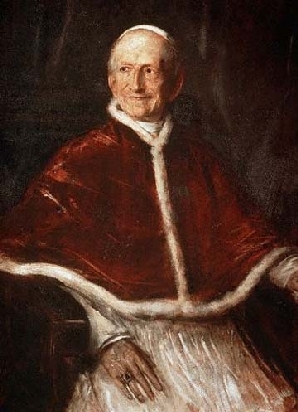 His Eminence Gregorio Giorgio Barnaba Luigi Cardinal Chiaramonti, O.S.B.Cas., Cardinal Priest of San Callisto, Bishop of Imola, was elected Bishop of Rome on 14 March 1800 in the monastery of San Giorgio Maggiore in Venice, taking the name Pius VII, and was crowned on 21 March, at the age of 59 years. His Eminence Annibale Francesco Clemente Melchiore Girolamo Nicola Sermattei Cardinal conte della Genga, Cardinal Priest of Santa Maria in Trastevere, former Bishop of Senigallia with the title of Archbishop ad personam, Prefect of the Sacred Congregation of Immunity, Vicar General of His Holiness for the City of Rome, Archpriest of the Patriarchal Liberian Basilica, was elected Bishop of Rome on 28 September 1823 in the Quirinal Apostolic Palace, taking the name Leo XII, and was crowned on 5 October, at the age of 63 years. 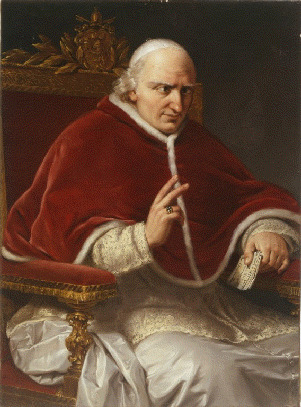 His Eminence Francesco Saverio Cardinal Castiglioni, Cardinal Bishop of Frascati, Major Penitentiary, Prefect of the Sacred Congregation of the Index, was elected Bishop of Rome on 31 March 1829 in the Quirinal Apostolic Palace, taking the name Pius VIII, and was crowned on 5 April, at the age of 67 years. 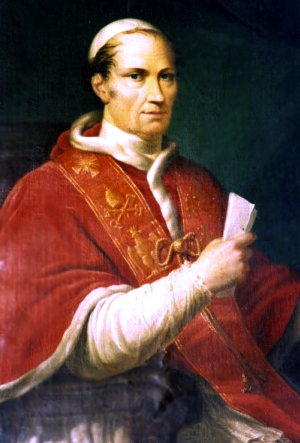 His Eminence Mauro Bartolomeo Alberto Cardinal Cappellari, O.S.B.Cam., Cardinal Priest of San Callisto, Prefect of the Sacred Congregation for the Propagation of the Faith, was elected Bishop of Rome on 2 February 1831 in the Quirinal Apostolic Palace, taking the name Gregory XVI, and was consecrated to the episcopate and crowned on 6 February, at the age of 65 years. 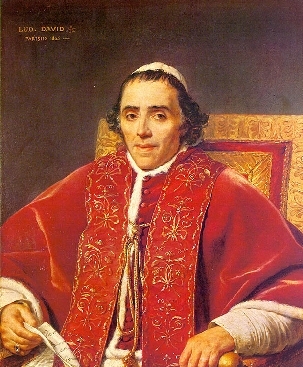 His Eminence Giovanni Maria Giambattista Pietro Pellegrino Isidoro Cardinal conte Mastai-Ferretti, Cardinal Priest of Santi Marcellino e Pietro, Bishop of Imola with the title of Archbishop ad personam, was elected Bishop of Rome on 16 June 1846 in the Quirinal Apostolic Palace, taking the name Pius IX, and was crowned on 21 June, at the age of 54 years. 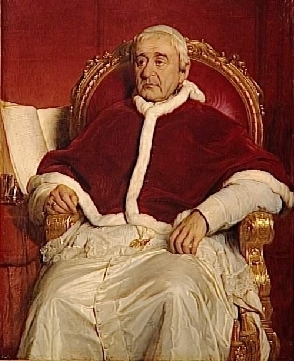 His Eminence Gioacchino Vincenzo Raffaele Luigi Cardinal Pecci, Cardinal Priest of San Crisogono, Bishop of Perugia with the title of Archbishop ad personam, Camerlengo of the Holy Roman Church, was elected Bishop of Rome on 20 February 1878 in the Vatican Apostolic Palace, taking the name Leo XIII, and was crowned on 3 March, at the age of 67 years. 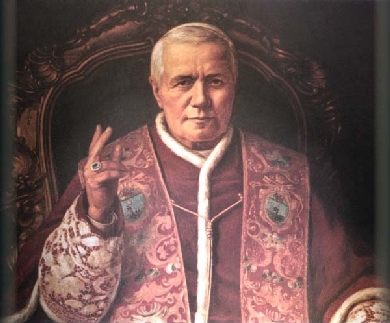 His Eminence Giuseppe Melchiorre Cardinal Sarto, Cardinal Priest of San Bernardo alle Terme, Patriarch of Venice, was elected Bishop of Rome on 4 August 1903 in the Vatican Apostolic Palace, taking the name Pius X, and was crowned on 9 August, at the age of 68 years. 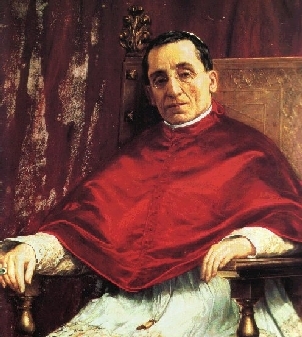 His Eminence Giacomo Giovanni Battista Cardinal marchese della Chiesa, Cardinal Priest of Santi Quattro Coronati, Archbishop of Bologna, was elected Bishop of Rome on 3 September 1914 in the Vatican Apostolic Palace, taking the name Benedict XV, and was crowned on 6 September, at the age of 59 years. 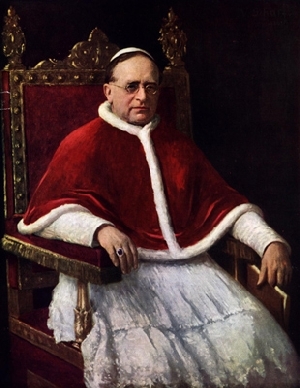 His Eminence Ambrogio Damiano Achille Cardinal Ratti, Cardinal Priest of Santi Silvestro e Martino ai Monti, Archbishop of Milan, was elected Bishop of Rome on 6 February 1922 in the Vatican Apostolic Palace, taking the name Pius XI, and was crowned on 12 February, at the age of 64 years. 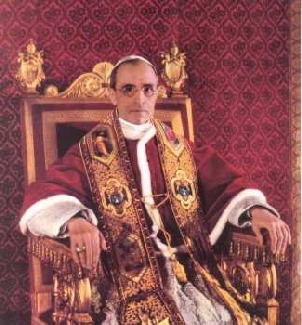 His Eminence Eugenio Maria Giuseppe Giovanni Cardinal Pacelli, Cardinal Priest of Santi Giovanni e Paolo, Secretary of State, Camerlengo of the Holy Roman Church, Archpriest of the Patriarchal Vatican Basilica, was elected Bishop of Rome on 2 March 1939 in the Vatican Apostolic Palace, taking the name Pius XII, and was crowned on 12 March, at the age of 63 years. 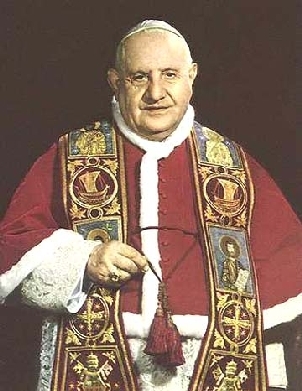 His Eminence Angelo Giuseppe Cardinal Roncalli, Cardinal Priest of Santa Prisca, Patriarch of Venice, was elected Bishop of Rome on 28 October 1958 in the Vatican Apostolic Palace, taking the name John XXIII, and was crowned on 4 November, at the age of 76 years. 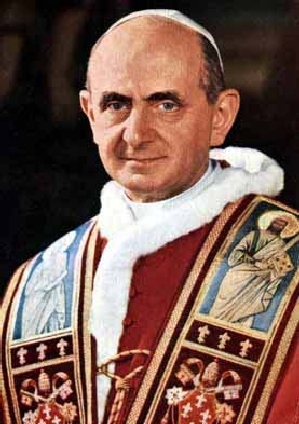 His Eminence Giovanni Battista Enrico Antonio Maria Cardinal Montini, Cardinal Priest of Santi Silvestro e Martino ai Monti, Archbishop of Milan, was elected Bishop of Rome on 21 June 1963 in the Vatican Apostolic Palace, taking the name Paul VI, and was crowned on 30 June, at the age of 65 years. His Eminence Albino Cardinal Luciani, Cardinal Priest of San Marco, Patriarch of Venice, was elected Bishop of Rome on 26 August 1978 in the Vatican Apostolic Palace, taking the name John Paul I, and was invested with the pallium on 3 September, at the age of 65 years. 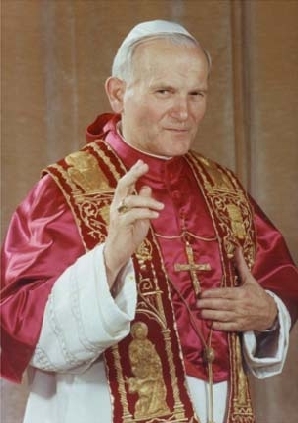 His Eminence Karol Józef Cardinal Wojtyła, Cardinal Priest of San Cesareo in Palatio, Archbishop of Kraków, was elected Bishop of Rome on 16 October 1978 in the Vatican Apostolic Palace, taking the name John Paul II, and was invested with the pallium on 22 October, at the age of 58 years. His Eminence Joseph Alois Cardinal Ratzinger, Cardinal Bishop of Ostia and of Velletri-Segni, Dean of the College of Cardinals, Prefect of the Congregation for the Doctrine of the Faith, President of the Pontifical Biblical Commission, President of the International Theological Commission, was elected Bishop of Rome on 19 April 2005 in the Vatican Apostolic Palace, taking the name Benedict XVI, and was invested with the pallium on 24 April, at the age of 78 years. 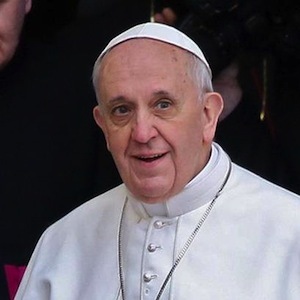 His Eminence Jorge Mario Cardinal Bergoglio, S.J., Cardinal Priest of San Roberto Bellarmino, Archbishop of Buenos Aires, Primate of Argentina, Ordinary of the faithful of the Eastern rites in Argentina without their own ordinary, was elected Bishop of Rome on 13 March 2013 in the Vatican Apostolic Palace, taking the name Francis, and was invested with the pallium on 19 March, at the age of 76 years. Ven. 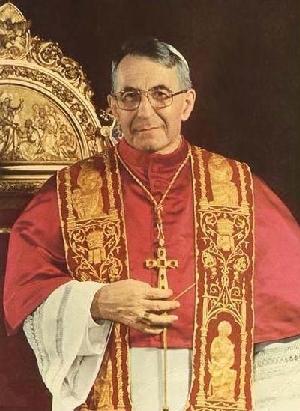 Pope John Paul I decided not to be crowned but chose rather to be invested with the pallium to inaugurate his papacy. His successors have done the same. See the credits for the information and pictures. Last site update: 20 March 2019. ©2004-19 Joseph L. Shetler, S.T.L.